After The Agency, the world’s premier employer of agents, spies, undercover workers, moles and sleepers shut down, there was chaos. Unemployed agents everywhere, their salaries no longer forthcoming and their secret identity without any backing. It was only natural that they would band together, trying to survive and, once that seems likely, profiting from the situation. In The Agents, you are one of those agents, trying to get enough of your former colleagues on your side to start a new organization to fill the void left behind by The Agency. You’re in a good start position for that, because you control two of the Agency’s Safe Houses. Or rather, half of a Safe House, because The Agency was exceptionally careful and did not let a single person manage important resources. All Safe Houses are under the control of two people. And that’s the setup for The Agents. Each Safe House starts one row of cards between two players. Each player ends up with two rows, called Factions and shared with each of his neighbours. And that’s where the problems lie, almost nothing in this game is entirely yours. Especially not the agents. The agent cards always work for both players controlling their Safe House, but not in the same way. When you play an agent as one of your two actions on your turn, you do so in one of your Factions, either facing you or your opponent. The player who ends up with the agents action facing him must execute this action. That may be killing another agent (turning him face down, but leaving the card on the table), taking an agent back to your hand, moving an agent card to another location… . Mostly, you would rather have those actions for yourself, but sometimes forcing your opponent to kill an agent in his other Factions is a good move as well. Especially since the player who doesn’t get the action gets the points. 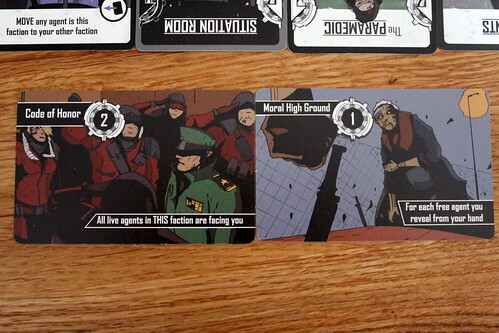 Each agent has, on the opposite side from his action, two half data tokens, one left and one right, and for each complete token facing you, you gain Intel Points, spy-speak for Victory Points, at the end of your turn. That sounds like a pretty easy decision, after all points are the gift that keeps on giving, and collecting 40 is enough to end and probably win the game. But the actions are not lost after they are played, either. Instead of playing an action card, you can spend an action to reactivate an action that is facing you. Now, the ability to move, turn or kill agents every turn is pretty tempting, too. But how do you collect points if you have all the actions facing you? Missions might help. With The Agency gone, former customers still have a need to have their problems solved, and that’s what you do with mission cards. You play them below a Faction and they give you points every round as long as their condition is fulfilled, meaning that your customers are happy. Admitted, they do have sort of silly requests and pay you for having some corpses lying around, or for having more agents in your other safe house. But like they say here in Germany, the customer is king, as long as they pay, we’ll happily oblige. Turning an agent – literally. This gives you a lot to think about already. In which Faction you play your agents, what way to face them and how to complete missions, that’s many decisions tied to each card you play. But there is another tough choice to make, and that is when you buy new cards. Unlike almost every other card game out there, The Agents doesn’t have a draw phase. Your only way to get cards into your hand is to buy them for Intel Points. Agents are somewhat cheap at one point per card, Missions hit you harder with a price of three points. But you really should buy some of them, because you start with one and you can play two on each of your factions. You don’t want to miss those points, do you? But the real cost of buying cards is the actions you spend on it: buying one card is an action, and so you spend some turns doing nothing but buying cards. I really like how you have to decide yourself if you want to pay for more cards, but spending an entire turn doing only that and nothing else is a bit boring. However, the decision to do that instead of something else is still not easily made. And that is already the whole basic game of The Agents. It ends when someone reaches 40 points, and that’s it. But few rules, in this case, doesn’t mean few things to do. 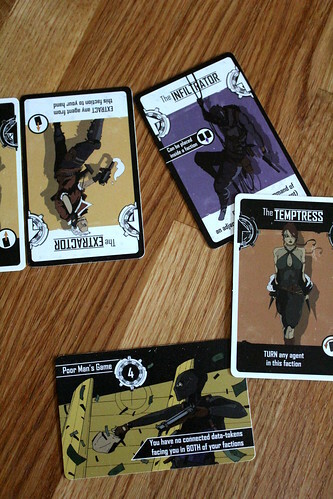 The Agents is a game of hard decisions, and the double-edged cards create some very interesting interaction. No matter what you do, you always help someone else at the same time. On the other hand, you can make other players work for you sometimes, when helping you complete a mission is still the best option for them. And nothing says that you can’t negotiate with them, either. Sometimes leaving your shared Faction alone benefits both of you. Due to the game’s setup, it’s a very different experience with different numbers of players. In two players, both factions are shared between you both and the game becomes very much a tug-of-war over who can extract the most points from them. Cooperation is not an option, and everything you do does a favor to your only enemy. In four or five players, on the other hand, you have one or two players that you almost don’t interact with. The only way to get to a player who isn’t your neighbour is with a Free Agent, a special type of agent card that is not played in a Faction, other than that you are isolated from them. That can be very frustrating when a player you can’t reach is about to win, and none of his neighbours are doing anything about it. Personally, I consider three players to be the sweet spot for this game because your directly interacting with everyone, but with different numbers of players The Agents still works very well. We’re on a mission. Two missions, actually. 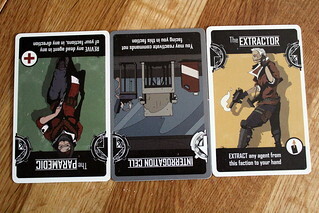 The edition from last year’s Kickstarter project came with three expansions that included new Agents, Missions, and Safe Houses respectively. Especially the Safe Houses add another level of problems to the game, because each of them grants a unique special ability to the one player it is facing. Those abilities are powerful enough that they influence your strategy as you don’t want to waste it, and in combination with your Commander card’s ability games can feel very different from one another. Just like the Safe Houses, the expansions’ Agents and Missions are powerful, but none so much that they unbalance the game. All in all, The Agents is a very cool game with an interesting twist to using cards, and certainly one you can feel happy about having Kickstarted. Or unhappy if you didn’t Kickstart it, but for that problem there is currently a solution. Creator Saar Shai is running another Kickstarter campaign for a second edition of The Agents, with slightly tweaked rules, upgraded components – the art was always great, but as someone that spent a lot of time picking up cards from the floor I would welcome the new ones being less slippery – and all new expansions. You can get the revised game, but if you already own The Agents you can also have the new expansions only.